While an orchestral arrangement is played during the opening credits, ‘We Have All The Time In The World’ is performed by Louis Armstrong and plays during the love montage between Bond and Tracy. Further, the title was a key phrase in Bond’s life with Tracy. Louis Armstrong, the Great Satchmo, lends even more of a human quality to this Bond film with his heartfelt ballad, yet another departure from the norm of the 007 movies, and plays well in the film and doesn’t feel clichéd or forced to lend an air of false sincerity. It is nothing but a trial and error method wherein you are sure about whether your deposit money would come back to you or just get back to the system causing a loss to you. Now to know the results of such a play, you need to become a part of the crypto trader trading system and try it for yourself. Bond drives along a coastal highway in the evening, and is passed by a woman in a sports car. Soon, he comes across the same car parked on the side of the road. Using a telescopic gun sight, Bond finds the driver, walking into the waves of the ocean, looking utterly lost. 007 realises what the woman is trying to do, and drives down to the shore where he dashes into the surf and plucks her from the sea. Three men then attack him. As Bond fights and finally comes to defeat them, the woman leaps behind the wheel of Bond’s car, drives it back up to where her own car awaits, jumps in and speeds away. Bond finds the same woman gambling at a casino later that same night. She makes a bet she can’t back up, and when she loses, it is Bond who comes to her aid, paying it for her. The woman, Countess Teresa ‘Tracy’ di Vicenzo ends up inviting Bond up to her room to thank him for his generosity. When he gets there, he finds one of the toughs he met earlier at the beach. After knocking the man unconscious, Bond goes to question Tracy, who has nothing to say. In the morning, Bond is escorted by gunpoint to a man by the name of Marc-Ange Draco and informed that Tracy, his problem child, is his only daughter and offers a huge sum of money for Bond to marry her and to keep her out of trouble. Bond agrees, but only on the condition Draco helps him to track down Ernst Stavro Blofeld. Bond returns to MI6, where M informs him he is relieved of the Blofeld matter. Bond resigns. He and Tracy, whom are both developing strong feelings for one another, go to Geneva, where Draco has unearthed ties to Blofeld in the form of a lawyer named Gumbold, who has documents that Bond steals, showing that Blofeld is interested in claiming a title. Disguised as Sir Hillary Bray, Bond infiltrates Blofeld’s new headquarters in the Alps where he is conducting allergy research. Guided by Irma Bunt, who helps Blofeld continue his research for the ladies who have come to him for relief from their allergies, he is introduced as someone who can help Blofeld’s search for the title. Despite his best efforts, Bond’s cover is blown, but not before he uncovers that Blofeld’s actual plan involves hypnotising his subjects to release a male sterility virus when they each return to their respective home countries. Bond escapes, and meets Tracy in a Swiss village where he proposes to her. Blofeld’s men track them down, and set up an avalanche in an attempt to ambush the couple. It works, and Blofeld’s henchmen think they’ve killed Bond and return to their headquarters with Tracy as their captive. Blofeld’s demands of the UN include a pardon of past crimes as well as official recognition of his title or he will unleash his virus that will end up killing plant and animal life. Bond, very much alive, joins forces with Draco to attack Blofeld’s stronghold, destroying it, and freeing Tracy. In a bobsled chase, Blofeld’s neck is broken when by a tree branch, allowing Bond to escape and marry Tracy. The film ends as they head on their honeymoon. A car drives past theirs as it is pulled over onto the soft shoulder. Blofeld is driving. Bunt is with him. She raises a rifle and opens fire, killing Tracy Bond. 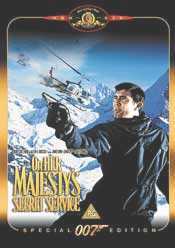 While having significant differences when compared to Fleming’s novel, On Her Majesty’s Secret Service remains the most closet adaptation when compared to its source of inspiration except for From Russia With Love. The biggest difference is probably Tracy being captured by Blofeld following the attempted escape from Piz Gloria she and Bond mount, which changes Bond’s (and Draco’s) motivation for the later siege of Piz Gloria. The moment served as a liability with the new Bond actually reminding his audience that indeed, something they’ve grown accustomed to is missing, and considering that is comes on the heels of one of the best opening sequences in a Bond canon, could have caused considerable problems for the suspension of disbelief. Yet somehow, that along with the remnants of any trepidation involving the new 007 melt away and we are left with what is most likely the best film in the entire canon. It allows Bond to show new depth, which was tough for some critics to appreciate. It is also the longest of the Bond films, clocking in at 140 minutes. But it is far from overlong. In all actuality, it’s the most fast-paced and linear Bond film, and the first to exhibit complex car chase scenes. No scene (well, except for Q’s radioactive lint part in the beginning, but… it’s Q) is extraneous, and each builds upon the last, as all good storytelling does. Bond films can be on the convoluted side, with double and triple crosses, scenes and points implied rather than shown, and multiple layers that can prove cumbersome to all but the most ardent of Bond fans, but not here. Telly Savalas is our Blofeld this time around, and does a fine job, rising above the clichés of hypnotic devices he uses on the ladies staying at Piz Gloria (he is sans scar, as well). There is a different sense of malice in Savalas’ portrayal of Blofeld when compared to Donald Pleasance, although it’s difficult to understand why Blofeld seems to have completely forgotten what Bond looks like… maybe he’s only toying with 007, lulling him into a false sense of security? Ex-Avengers star Diana Rigg is easily the most inspired choice for a Bond girl in the canon. She is sleek, smart, and entirely confident in her sexuality. Like Bond, she is on guard and is as surprised as he is at the strength of their feelings for one another. She is every bit the equal of 007, even going so far as pulling a gun on him. Tracy provides a rudder for Bond’s life, and this is attested to all the more by Bond’s decision to leave the Secret Service. Between acting ability and beauty, Diana Rigg remains the ultimate Bond girl in what stands to be one of the best Bond films. Replacements need not apply.